California’s two nuclear power plant locations: Diablo Canyon and San OnofreUpdated satellite photos from Japan, before and after the earthquake, including the Fukushima Daiichi Nuclear Plant. From the NY Times. 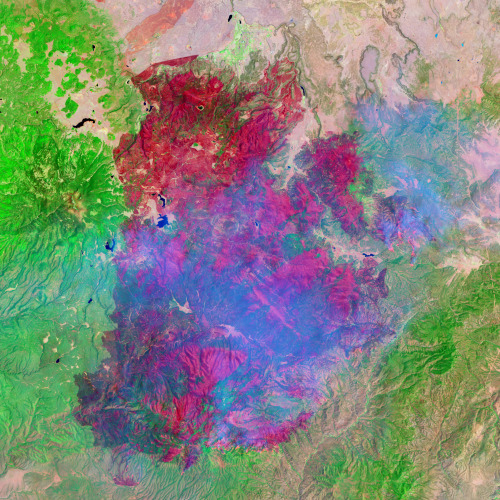 Imagery from GeoEye and Digital Globe. FYI, California’s two nuclear power plants, the dual-unit Diablo Canyon and dual-unit San Onofre systems, produce about one-fifth of the state’s total electricity generation. San Onofre is featured in a number of films, including Naked Gun. Both are apparently designed to withstand earthquakes of 7 or 7.5 magnitude, depending on who you ask. From Mark. Animation of the tsunami moving across the Pacific, from noaa. Note: The Map Room has a good wrap-up of related maps, updated almost daily. 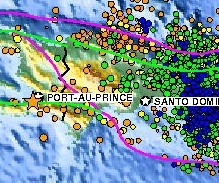 The Haiti earthquake, 7.0 magnitude, struck about 10 miles south-west of Port-au-Prince, was quickly followed by two aftershocks of 5.9 and 5.5 magnitude. The automatically generated Preliminary Earthquake Report from the USGS shake map U.S. Geological Survey includes many maps, including a shake map (top) and a look at historical seismicity in the area (bottom). More maps here. They say: The January 12, 2010, Haiti earthquake (7.0 magnitude) occurred in the boundary region separating the Caribbean plate and the North America plate. This plate boundary is dominated by left-lateral strike slip motion and compression, and accommodates about 20 mm/y slip, with the Caribbean plate moving eastward with respect to the North America plate. Historical seismicityThe location and focal mechanism of the earthquake are consistent with the event having occurred as left-lateral strike slip faulting on the Enriquillo-Plaintain Garden fault system. This fault system accommodates about 7 mm/y, nearly half the overall motion between the Caribbean plate and North America plate. More here. From the U.S. Geological Survey, National Earthquake Information Center, World Data Center for Seismology, Denver. And from NASA Earth Observatory, a map showing the topography and tectonic influences in the region of the earthquake. The NYTimes mapping division has a useful before and after tool using satellite (GeoEye) imagery; several key buildings are highlighted. ShakeMap of the 1989 M 6.9 Loma Prieta EarthquakeToday is the 20th anniversary of the Loma Prieta earthquake. Although a bay area native I was not here then, but remember it vividly. I was worried about my parents, my childhood haunts, and Jose Conseco, who was playing at the time for the Oakland A's in the "Bay Bridge World Series" vs the SF Giants. Fans at the game on October 17 1989 talk about the field bulging and moving like a "giant rolling pin under the ground." Jose and my folks were ok, but many people lost their liv Expected Levels of Shaking from Future Earthquakeses, the bay bridge was changed forever, and the region sustained billions in damage. There are many great maps of the shaking produced by the 6.9 quake, here is one at left found at the USGS guide to living in earthquake country. The region is still primed for another big shake: look at this graphic of potential shaking forecasted for the future. 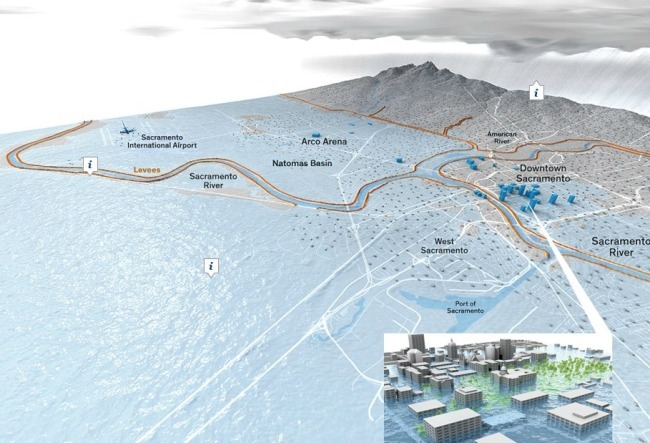 A great source of maps and animations about the Delta is the Public Policy Institute of California. See their map of a possible future delta; and their animation of another possible future delta (underwater). It's back: discussion about the use of arson and catastrophic fire by terrorists. The Fire Center have been talking about this; and I think this kind of worry was what helped us get homeland security money for fire research and outreach in pre-Katrina times.